CMC Triggers innovative, self-contained, and easy-to-install AR-15 Trigger Groups, have been completely re-tooled to maximize production capacities, incorporate new design enhancements and reduce cost to the customer. 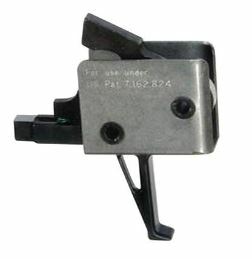 CMC Triggers AR-15 Drop-in Trigger Groups have always yielded exceptional trigger pull dynamics for our hundreds of thousands of satisfied customers. CMC's critical sear engagement surfaces have a propriety machining process that renders superior surface finish and dimensional control. As compared to our competition, the techniques we use establish a 1-2 RMS surface finish as opposed to EDMing which leaves a pitty 32 RMS at best. Compared to a mirror which is 0 RMS, this is what sets the CMC Trigger apart from it competition.